London Anniversary Games 2016 | What are Team GB's chances? 4 Years on. How do you think Team GB will do in the 2016 London Anniversary Games? 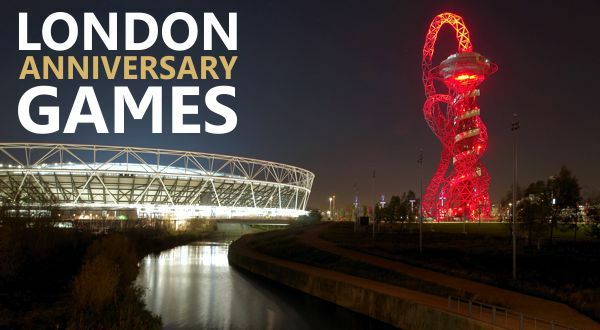 The London Anniversary Games start today, at the Olympic Stadium in the capital’s Queen Elizabeth Olympic Park, and some of the world’s top athletes will be participating. With just two weeks to go until Rio 2016, it’s the last chance to see some of the track and field competitors in action before they try to make their Olympic medal-winning dreams come true. So what are the London Anniversary Games and which competitors should we be keeping an eye on? Will any of Team GB’s athletes put in podium-topping performances? Previously known as the London Athletics Grand Prix, this annual meet had a name change in 2013, when it took place at the Olympic Stadium exactly twelve months after the start of the 2012 Olympics. Formerly held at Crystal Palace, the meet is now part of the IAAF Diamond League calendar. The Diamond League consists of fourteen invitation-only meets, each of which includes a number of “Diamond Races”. Athletes competing in 32 different disciplines can score points at the meets, while the winner of each “Diamond Race” takes home $40,000 and a trophy. The most famous race on the Anniversary Games’ schedule is the Emsley Carr Mile, which has taken place annually since 1953. Instead of presenting the winner with a traditional trophy, like a silver cup, the organisers chose to use a book, bound with Moroccan leather, in which the race results and competitors’ signatures are recorded. This year’s Games also incorporate the IPC Athletics Grand Prix final, which will feature some of the world’s leading para athletes, many of whom will be competing at the 2016 Paralympic Games. Which Athletes will be Appearing at the Anniversary Games? The biggest star appearing at the Games is Usain Bolt, who will be competing in the 200 metres. The Jamaican athlete has won a record-breaking six Olympic gold medals for sprinting, but his fitness for Rio had been looking in doubt, after he suffered a hamstring tear which forced him to pull out of the Jamaican Olympic trials at the beginning of the month. As a result, his performance at the meet will be scrutinised by the world. British sports fans will be keen to see Jessica Ennis-Hill in the 100 metre hurdles and long jump events. One of the stars of what became known as “Super Saturday” at the 2012 Olympics, a day on which Team GB’s sportsmen and women claimed six gold medals, Jessica is the reigning Olympic women’s heptathlon champion and will be defending that title in Brazil. Ennis-Hill had a difficult start to 2016, thanks to an Achilles tendon injury, and was unable to compete until May. In June, however, she won the IAAF Combined Events Challenge heptathlon in Germany, setting a personal best for the long jump in the process. Jonnie Peacock, London 2012 gold medal-winner, in the 100m T44. Are you a fan of track and field events? Who will you be cheering for at the London Anniversary Games? Let us know on Facebook, Twitter or by adding a comment below.